Pizza in a cone? D'accordo! Pizza in a cone? No way! Yes, way. If you haven't heard about pizza in a cone -- let alone tried it -- then you probably haven't been to Italy, where people have been enjoying Kono Pizza for a decade. Carlo Ruggiero wants to change that. The master franchisor, who hails from Naples (Italy, not Florida), is bringing Kono, a chain of pizzerias that serve it by the cone, not the slice, to the U.S.
"I loved this product from day one," said Ruggiero, who first tasted Kono a decade ago in Milan, where it was invented by the chef Rossano Boscolo. "I love the taste, the mobility, the authenticity." The varieties of Kono include pepperoni, chicken Parmesan, meat (turkey, bacon and ham) vegetarian, prosciutto with mozzarella, and Ruggerio's favorite flavor, margherita, since it hails from his home town. There are also breakfast and dessert cones. They cost from $3 to $5. Ruggiero told CNNMoney that handheld cone-shaped pizza is known in Italy as "pizza al passeggio," which translates to "walk away pizza." This convenience - or portability, as Ruggiero calls it - means that cone-shaped pizza was "launched and created in the wrong country. Because in Europe we sit down. For two or three hours for a meal." "In the states, we're always on the go," he said. "You can walk around eating original Kono pizza while you're on the phone, while you drive." 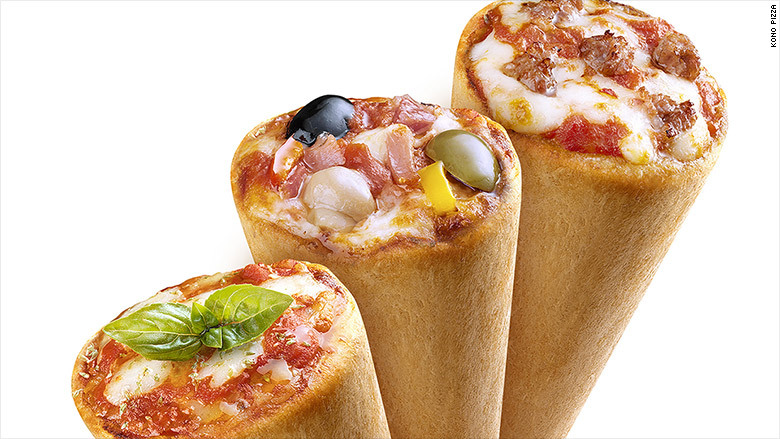 The cone pizza is assembled to order, with the various ingredients - sauce, cheese, vegetable and meat toppings - piled into the cone, which is made from fresh dough. Ruggiero said the entire process takes three minutes and the cone has less than 200 calories. He said the brand has expanded to 140 restaurants in 20 countries, including Dubai, Australia, Japan, China, Thailand, Aruba, but only in three locations so far in the U.S.
Carolo Ruggiero said that Kono Pizza can be prepared in three minutes. Ruggiero has major expansion plans. He said he's sold 22 franchises, with eight to 10 new restaurants set to open this year, in locations including Philadelphia, Charlotte, N.C., and Newport, N.J.